Engineering at the University of Toronto once again ranked in 10th place overall among the world’s universities and colleges and 1st in Canada, in a recent ranking by the U.S. News & World Report’s inaugural World’s Best Colleges and Universities of 2008. 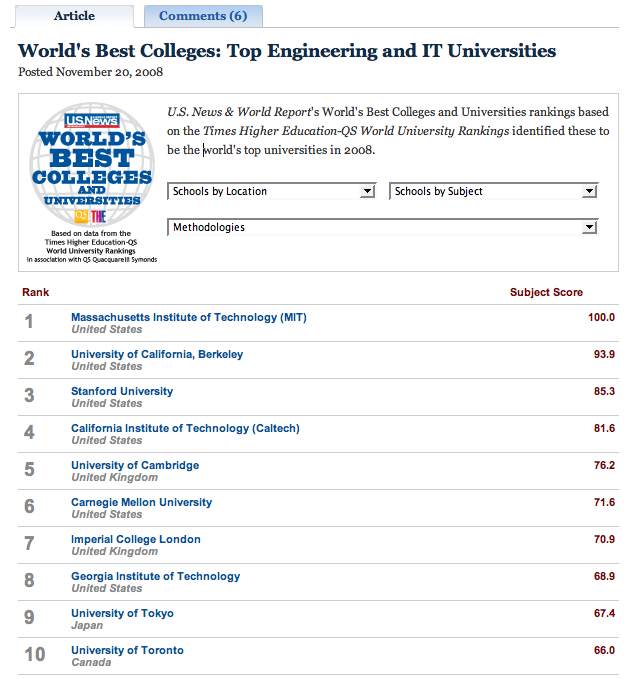 In 2008, U of T Engineering also ranked 1st in Canada and 10th overall in the world in the Engineering and IT category of the Times Higher Education-QS World University Rankings, up from 11th in the world in 2007. Using data from the Times Higher Education-QS World University Rankings, this is the first ranking of the world’s best colleges and universities by U.S. News & World Report. The magazine U.S. News previously produced a U.S. ranking of colleges and universities for the past 25 years. Visit the U.S. News & World Report website for more information. Engineering at the University of Toronto continues to be a global leader in the prestigious Times Higher Education-QS World University Rankings Engineering and IT category. This year, Engineering at U of T ranked 10th overall in the world, up from 11th in 2007, and remains in first place among Canadian universities for a second year in a row.